As the second morning of the Battle of the Bulge dawned, the 110th Infantry Regiment stood firm along the Skyline Drive. The 112th and 109th Regiments to the north and south had both faced determined attacks, the 112th from a full Panzer division, and the 109th from elements of General Branden-not-featuring-in-this-AAR-berger’s Seventh Army, but neither had given much ground. All three of the 28th Infantry Division’s regiments were likely to face heavy attacks in the upcoming day, and if the 109th and 112th were forced to retreat or even bent backward, the 110th would risk being encircled. Overnight, the Seventh Army’s 5th Fallschirmjäger Division attacked at Hoscheid, the boundary between the 110th Regiment’s sector and the 109th’s sector. General Cota saw reports that they were forming up, and quickly ordered the 109th to send infantry and tanks to bolster the defense. They never made it into the town; the Germans had already crossed the Skyline Drive before it reached Hoscheid. The 109th’s Antitank Company, defending in town, was to hold for most of the 17th, but the 109th would no longer feature in the battle for the Clerve. In the north, the 112th, too, would be forced away to the north and northwest, but then, anyone looking at a map could have said that the burden on the Allied side in the race for Bastogne would weigh heaviest on Hurley Fuller and the 110th Infantry. The action started well before dawn, as German artillery spotters sneaking into Clervaux under cover of darkness called artillery fire in on the town. German patrols got into town under cover of the shelling and brought the battalion headquarters company under fire. Battery B of the 109th Field Artillery, which had fallen back to positions near Clervaux the day before, had to fall back further, and that was to put them out of range to support Colonel Fuller’s planned counterattack on Marnach with his 2nd Battalion. At the same time, Germans pushing past the Skyline Drive to the north overran Battery A, driving the artillerymen off and capturing all of the guns. Battery C and the regiment’s Cannon Company were focused on providing support to Hosingen and points south, and were soon to come under attack anyway. Without fire support, 2nd Battalion’s attach on Marnach was unlikely to succeed. You’ll want to refer to the map in the previous post for the geography here: 2nd Battalion marched northeast from Clervaux to the crossroads north of Reuler, which overlooked Marnach, but by the time they arrived, German tanks were already rolling west from Marnach and toward Reuler. Reinforcements from A Company, including support from light tanks, rolled out from Heinerscheid at about the same time, but German anti-tank guns in Fishbach (hey, it did feature again!) stopped those reinforcements cold. Further armored reinforcements, unexpected ones at that, arrived in Clervaux, but Fuller had little choice but to commit them in small portions. His orders were to hold every position at all costs, though, so he had little choice. The Germans pushed from Marnach, pressuring 2nd Battalion between Reuler and Urspelt, and eventually surrounding them. As night fell, 2nd Battalion’s commander ordered his five attached tanks to fight a rearguard action, while the infantry split into small groups and tried to exfiltrate back to Clervaux. None of the tanks were to escape. Only sixty infantry out of more than four hundred escaped the pocket. South of the fighting around Marnach, the Americans remained hard-pressed. Positions at Bockholz and Munshausen were shortly pushed back toward Drauffelt. By noon, Hosingen was surrounded, and given the way the rest of the sector was going, there was little hope for relief. The defenders held through the night of the 17th, driven in two by the overwhelming force of elements of the 2nd Panzer Division, the 26th Volksgrenadier Division, and the leading elements of the Panzer Lehr Division. Early in the morning of the 18th, they surrendered. Consthum, formerly 3rd Battalion’s command post, was lost at around the same time; the tattered remains of 3rd Battalion fell back toward Wiltz. The town nestles in a very phallic-looking curve of the Clerve River, and features four crossings over that watercourse: one north and one south of the chateau in the middle of the bend, and a rail bridge and road bridge to the northwest. The road that runs off the top left corner of the map goes to Reuler. The road to Marnach enters on the right edge of the map, then descends in a series of S curves in the bottom center of the map. At 9:30 a.m., German tanks and halftracks began to descend along those curves for the first time, trading losses with American tanks climbing to defend the town. Both sides fell back, the Germans to lick their wounds and the Americans to reload; Fuller had to recall forces he had in Munshausen to defend. 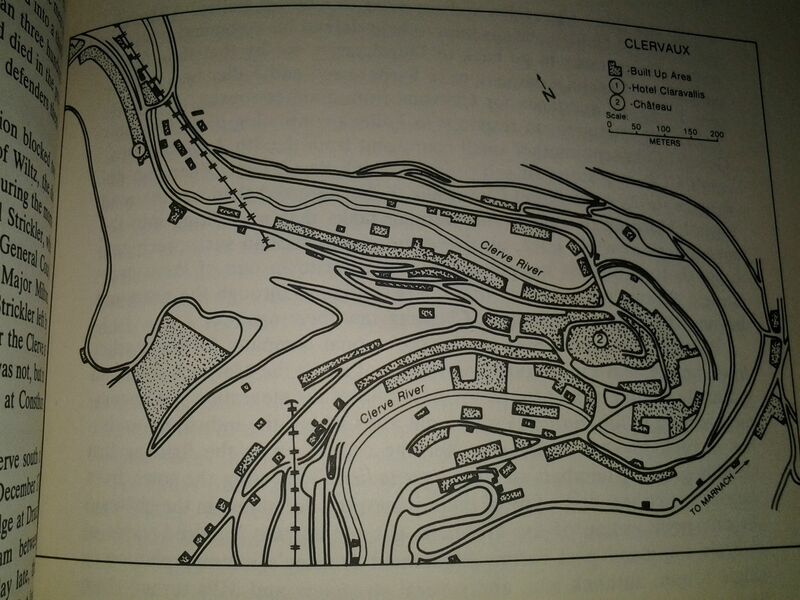 They reached Clervaux along the south road just as more German tanks reached the top of the hairpin turns. The lead Sherman knocked out the lead Pzkpfw IV at the top of the hill, which effectively blocked the Germans from entering town that way. Pressure on Clervaux increased steadily throughout the afternoon, as Panzergrenadiers infiltrated from various directions and brought the defenders under fire. At one point, Germans got within 200 yards of Fuller’s command post, before a ragtag group of defenders and a single 57mm anti-tank gun managed to force them back. That was one victory in a long string of retreats, though; defenders from the Marnach-Clervaux highway trickled into town as the day wore on, and when the 2nd Battalion near Reuler collapsed at around 6:30 p.m., tanks made their way down the north road. Newly come to the 28th Division, Fuller was not yet a trusted member of the family, and who was to say whether his dolorous assessment of the situation was accurate? […] Again Fuller got Colonel Gibney on the phone, but again Gibney refused permission to withdraw. Even as the two were talking, a staff officer ran into the room to tell Fuller that six German tanks were approaching the hotel [where Fuller had placed his command post]. Fuller told that to Gibney. He would obey the order to hold, said Fuller, but as a Texan, he wanted Gibney to know that he was assigning him the same fate as befell the defenders of the Alamo. At that moment three shells from German tanks exploded one after another inside the ground floor of the hotel beneath the room from which Fuller was talking. “What was that?” asked Gibney. Fuller told him. When Gibney began to say something more, Fuller interrupted; he had “no more time to talk,” he said brusquely, and rang off. Fuller and twelve men made a daring escape from the hotel, crossing a twelve-foot ladder balanced between one of the windows and a fire escape carved into the cliff to the west of the hotel, Fuller carrying a blinded soldier the whole way. He made his way westward to Esselborn, hoping to find a telephone or Company G, which had been released from its task defending the divisional headquarters, but neither was to be found. 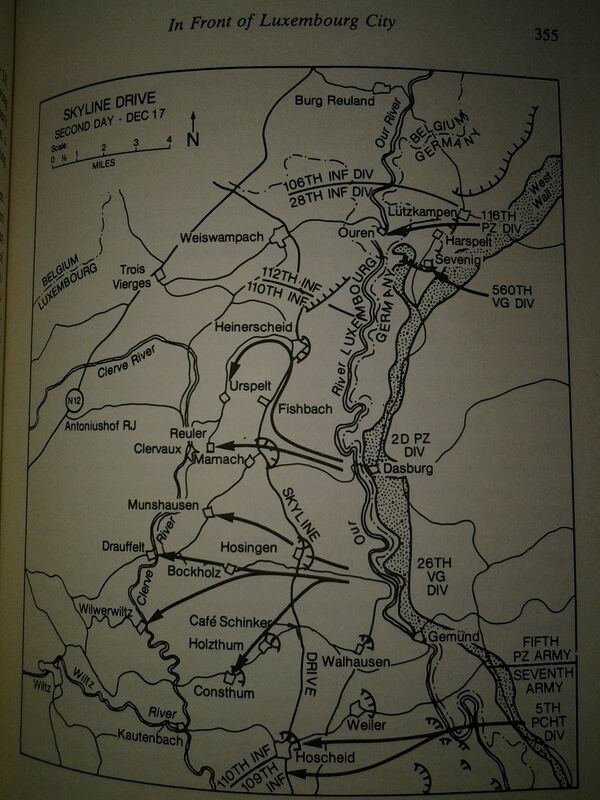 By midnight on the 17th, the Germans had effectively gained the Clerve River. Pockets of resistance remained at Consthum, Hosingen, and at the chateau in Clervaux until the early part of the 18th, but the Fifth Panzer Army had its crossings. The race was on: the Second Panzer Division, driving westward from the Clerve, against CCB of the 10th Armored Division, already on the way, and the 101st Airborne Division, ninety miles away in Rheims. MacDonald was an infantry officer in the Second World War, and it shows in his terminology: American tanks he refers to as ‘Shermans’, although there were at least two variants in service, one with a significantly better gun than the other. The M10, M18, and M36 tank destroyers were all in service at the time, but his habit of referring to all of them as ‘self-propelled tank destroyers’ makes it difficult to distinguish the first two (the latter had a 90mm gun, which is usually mentioned—it was one of the best AT guns of the war). By contrast, he also writes of ‘towed tank destroyers’, which is quaint to my ear. It’s surprising to me how little the average infantryman knew of the hardware on his side, too: there are multiple accounts of troops with degrees of prior combat experience mistaking Panthers for Shermans, and even in the dark I don’t think that’s a mistake I could make.